It’s the 21st century. So why settle with flipping on countless light switches in your house or workplace when you can have a designed lighting sequence leading from one room to another with the touch of just one button? Felder Electric is qualified to install many forms of home automation and lighting systems in new construction and renovation construction projects. Whether you need intuitive lighting, security or entertainment systems, Felder Electric can install them the way you want them. Don’t settle for an unoriginal electrical design in your home or office — Have one that is designed specially for your needs and desires. Vantage Controls is one of the leading pioneers in computer-programmed home automation in the United States. 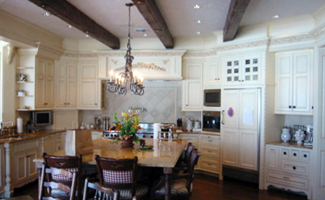 Created over 20 years ago, Vantage Controls is all about customizing a new or existing home and its electronics to its homeowner. From the touch of a button, homeowners can easily control the complex settings of their home’s lighting, music, video, windows and room temperature. 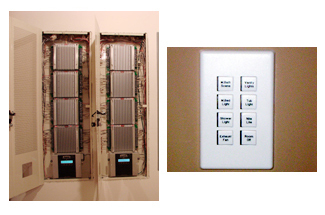 With Vantage, customized keypads and touchscreens replace the classic toggle switches of a home. Homeowners can also enjoy the option of remote access to their home’s systems from anywhere. Felder Electric is one of the few licensed dealers, installers and programmers of Vantage Controls home automation in Minnesota. We’ve installed homes with all of Vantage’s product lines, including Infusion, QLink and RadioLink™, the wireless format of Vantage Controls. Take a look in our photo gallery. Interested? Check out the customization options at the Vantage Controls Web site. Creators of the first lightswitch designed to dim lighting, Lutron® Electronics has a vast array of home automation products for both the home and workplace. For customizable residential lighting systems, Lutron® has its AuroRa®, RadioRA® and Homeworks® product lines that use wireless, radio frequency controls. All of its product lines are available for new construction and retrofit projects. Lutron® Electronics also has a plethora of system options for commercial buildings, each making the workplace more individualized and efficient. Felder Electric has installed many of Lutron®’s product lines in past homes and offices. Find more information and options about Lutron®'s home automation system lines at the Lutron® Electronics Web site. Designed by Cooper Wiring Devices, Aspire RF™ is a wireless lighting control system focused on customizing homes with lighting design and making things as simple as touching a button. Much like its competitors, Aspire RF™ offers numerous customizable options for homeowners wanting to control the lighting of their homes from inside and outside the home. Read more about the options at the Cooper Wiring Devices Web site. Lite Touch® boasts over 50 years of experience in lighting control and dimmers. After company conglomerations, Lite Touch® Inc. specializes its products in residential, light commercial and commercial forms of construction. Much like it’s competitors, Lite Touch® offers customizable lighting design with custom engraved keypads throughout a home or workspace. Lite Touch® products can also be retrofit into existing buildings. Learn more at the Lite Touch® Web site.